TOTALLY RENOVATED in appearance thanks to the redesign of all the rooms and the inauguration of a café named after the historic Wittgens director. Il 1° ottobre il pubblico ha potuto ammirare il riallestimento di tutte le 38 sale – On 1 October the public was able to admire the rearrangement of all 38 rooms – La caffetteria acquisirà i suoi prodotti in un orto a sud di Milano e ospiterà al suo interno tele delle collezioni museali. The cafeteria will acquire its products in a vegetable garden south of Milan and will host paintings from the museum collections. Un percorso espositivo in una delle Pinacoteche più famose d’Italia e del mondo. An exhibition itinerary in one of the most famous art galleries in Italy and in the world. Trentotto sale, una panoramica sull’arte pittorica che va dal gotico medievale al Novecento, con lo sguardo puntato sui capolavori della pittura Lombardo-Veneta, ma che accoglie importantissime opere del Rinascimento fiorentino e dell’Italia centrale, oltre ad ospitare importantissimi artisti stranieri. Thirty-eight rooms, an overview of pictorial art ranging from medieval Gothic to the twentieth century, with a gaze focused on the masterpieces of Lombard-Venetian painting, but which includes important works of the Florentine Renaissance and central Italy, as well as hosting important foreign artists. This is how the Pinacoteca can admire timeless masterpieces such as the Dead Christ and the Madonna con Bambino by Andrea Mantegna, the great hall dedicated to Lorenzo Lotto, Tiziano and Tintoretto, with the wonderful Finding of the Body of San Marco. Among the masters of the Renaissance are Piero della Francesca, with the latest work created by the humanist innovator, the Pala Montefeltro; the urbinate Bramante, who was the founder of the Milanese Renaissance during his Milanese stay, of which Christ is kept at the Colonna; and finally Raphael, whose Marriage of the Virgin is certainly one of the best known works in the collection. 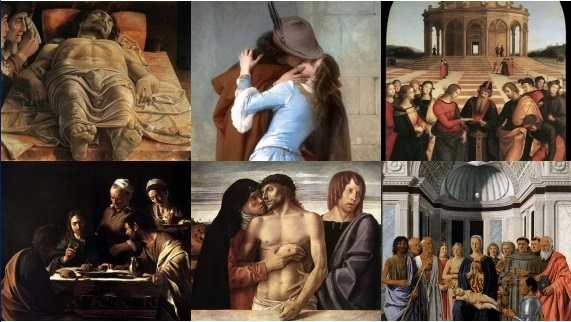 Noteworthy are the paintings by Caravaggio from Bergamo, to whom Room 29 is dedicated, which houses two very important works such as the Cena in Emmaus and the Canestra di Frutta, as well as many paintings by the seventeenth-century Caravaggio painters. Among the foreigners, prominent names are undoubtedly Rubens, the seventeenth-century Flemish master, and his pupil and friend Antoon Van Dyck, leading exponents of Flanders painting. The collection does not fail to present the Macchiaioli masters of the nineteenth century, the famous romantic painter Hayez, whose famous Bacio finds space in the Pinacoteca, and finally the contemporary painting of great artists such as the furious Boccioni (The City that rises), Modigliani (l’Enfant Gras) and even Picasso, here present with his Testa di Toro. An experience of great importance, a well-constructed and complete journey through the fundamental centuries of the history of Italian painting and beyond, punctuated by immortal masterpieces and supported by works by lesser known artists, but fundamental for the vitality and pictorial development of our country. 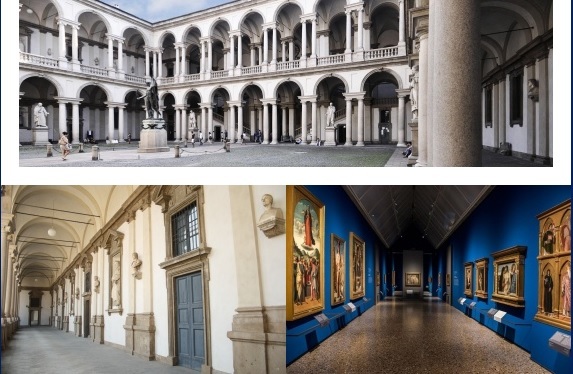 Institutional video of the Pinacoteca di Brera | Official video of the Pinacoteca di Brera A trip inside Brera, its architecture, its institutes, the halls and the masterpieces of its permanent COLLECTION. Felicity Viaggi di Tizetatre S.a.s. Enter your Email to receive our promotions! Read information note, I hereby consent that the information I provide will be communicated to third parties and used for sending information and commercial offers. the fulfillment of market research, commercial statistics or direct marketing actions.